1. Crush the wasabi peas under a medium cast-iron skillet, then mix them with the fried garlic and sesame seeds in a wide bowl. This is the crust for your burgers. 2. Melt the butter in the skillet over medium heat. Brown the cut sides of the buns in the hot butter, then remove to a work surface. 3. Crank the heat under the skillet to medium high. When wicked hot, add the burgers and cook until seared and browned, 3 to 5 minutes per side. 4. Meanwhile, whisk together the tamari and sesame oil in a wide bowl until blended. Dip the cooked burgers in the tamari mixture, then coat in the sesame seed crust. 5. 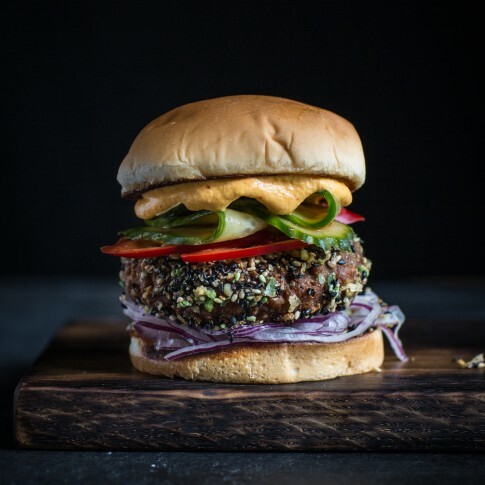 Pile the burgers onto the buns with the kimchi mayo, red onion, cukes, and chiles. You can find fried garlic, usually from Thailand, in jars in Asian markets and some grocery stores. Blend the kimchi in a blender (preferably high-speed), slowly at first, then gradually speeding up, until the kimchi is smooth. Blend in the mayo and sesame oil until smooth. Keep chilled in the fridge for up to a week.